Sunday is NYC Food Guy’s gluttony day. And what better way to invoke the 2nd of the seven deadly sins than with $28 all you can eat ribs at my favorite BBQ spot, Georgia’s Eastside BBQ. Why is it my favorite? Well aside from the meaty, fall-off-the-bone ribs, the service is great and it’s affordable. 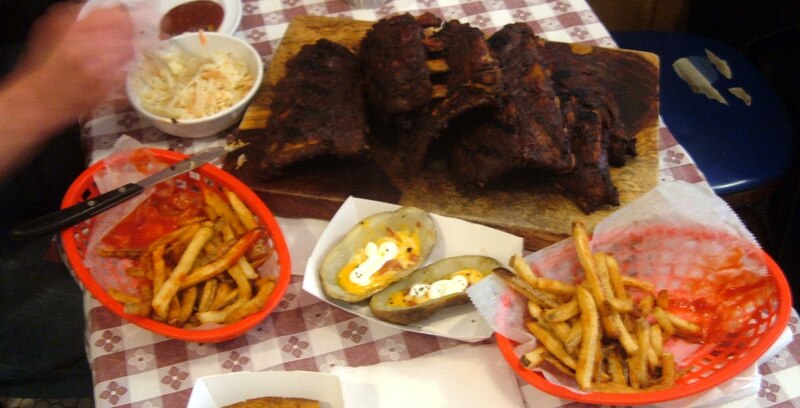 Since my first post they’re no longer offering unlimited sides with the all you can eat, something they tinkered with early on, but that shouldn’t matter because you’re here for a carnivorous feast and Baby Back Ribs are the star of the show. The ribs– baked over beer between two cookie sheets before being tossed on the grill and sauced up- arrived hot, fall-off-the-bone, and very meaty. The skin was drier than usual so we asked for extra sauce, a mandatory move, regardless of skin quality. The fries were spot on, crispy and cooked fresh. Pass on the potato skins ($4), listed as a special, they arrived undercooked and underloaded. The cabbagey cole slaw is sweet and light, a nice “palate cleanser” as King of Ketchup called it. After the King and I polished off two racks of ribs each and paid our $64 bill, it was off to sugar Sweet sunshine for some of the city’s best Banana Pudding. 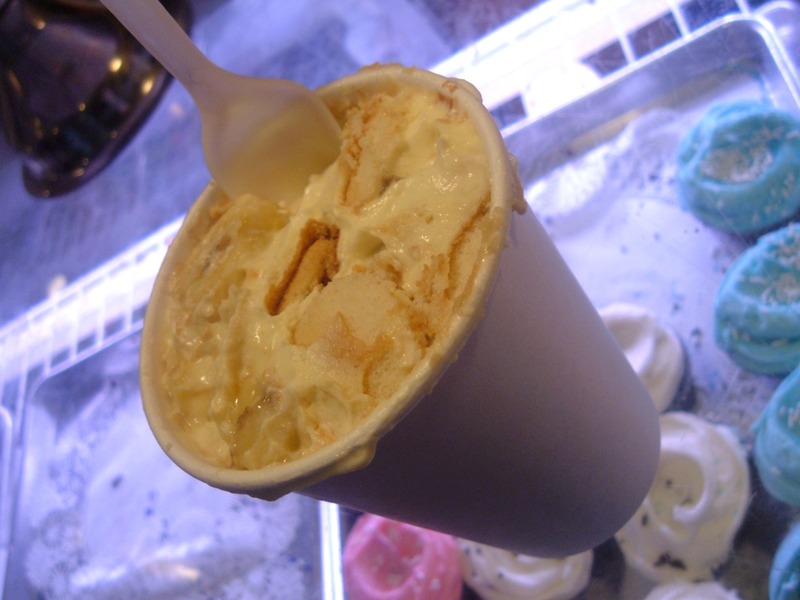 The key to great Banana Pudding is simple: 1) Balanced ratio of ripe banana to Nilla wafer and 2) rich, creamy pudding. sugar Sweet sunshine’s ratio favors the Nilla wafer, but it makes no difference, the pudding is so sweet and decadent, you’re forced to sit down in one of their comfy armchairs and enjoy the knee-buckling deliciousness. A $4 small cup is more than enough for two people. Their cupcakes are great as well, better than Magnolia’s. Go with the Ooey Goey (chocolate cake with dark chocolate almond buttercream frosting), it’s the co-owner Deb’s favorite. Alan Natkiel opened Georgia’s East Side BBQ in July 2007 based around one simple concept: Authentic, cheap, and massively portioned Southern BBQ. After eating there for my 5th time Sunday (11/4/07), this time for All-you-can-eat Ribs ($28 with 3 unlimited sides), I’ve realized Mr. Natkiel has accomplished his goal.